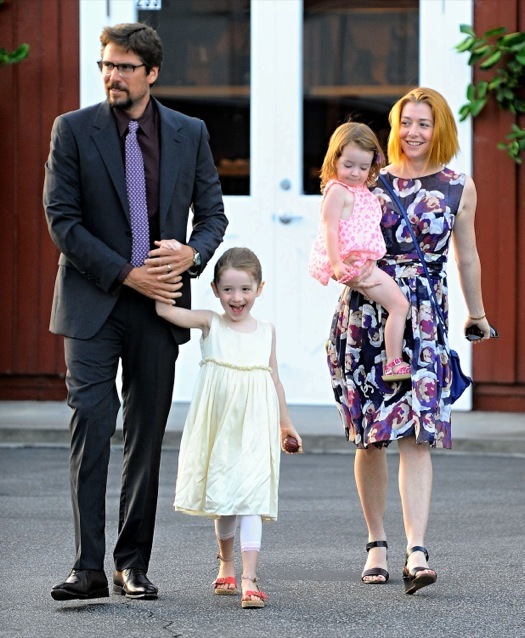 Alyson Hannigan and husband Alexis Denisof were photographed taking their daughters Satyana and Keeva out for dinner at the Brentwood Country Mart in Brentwood, CA on Wednesday (Sept. 3). The How I Met Your Mother actress was dressed up in a floral printed dress with black sandals. She carried Keeva while suit wearing Denisof held Satyana’s hand. Hannigan has had lots of time to bond with her children this summer after the series wrap of How I Met Your Mother. Although, the star will be back on the small screen in the near future. She has nabbed the lead role in the CBS pilot More Time With Family, a multi-camera comedy produced by Ben Affleck and Matt Damon. The show stars Tom Papa, who plays a man who undergoes a career change to spend more time at home with his family. It is based on Papa’s stand-up comedy and Damon’s experiences. Hannigan will play Papa’s onscreen wife, Cindy.